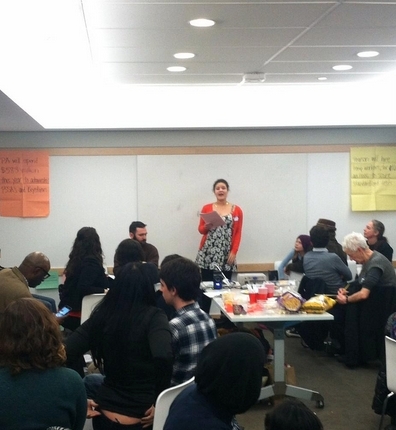 On Thursday, February 26th, at the Free Library of Philadelphia, PSU members joined teachers, parents and community members for the “Test-in” & Forum on High Stakes Testing. This event was sponsored by the Caucus of Working Educators, Alliance for Philadelphia Public Schools, Teacher Action Group, Parents United for Public Education, Action United, and PSU. Participants at the event answered sample PSSA and Keystone test questions and heard teachers break the code of silence and reveal the the injustice of high stakes testing from the classroom perspective. We also learned exactly how much money and time is spent on testing annually in our schools and how parents, teachers, and students have fought back against high stakes testing in Chicago, New York, Seattle and other cities across the country. Good evening. My name is Ruby Jane Anderson. I am a member of the Philadelphia Student Union and a senior at Science Leadership Academy. At PSU, we define violence as power that harms one’s chances of survival. A high school diploma is the first step to getting a job and being able to live. Instituting a high-stakes test while simultaneously defunding public schools set students up for failure harms our ability to live and it is an act of violence. Last year, my Physics teacher was forces to dedicate two full weeks of class time to prep us for the Keystone biology test. Even though a third of the class had passed or opted out, all of us had to sit through the mind-numbing test drills and memorization activities. Going to physics became something I dreaded because I knew that for those 64 minutes of test prep, I was not fully human. I was a robot, programmed to find answers as quickly as possible. My thoughts and feelings were irrelevant. The only thing that mattered was my ability to produce the answer; the right answer. The fallacy in standardized testing is that students do not come standardized. In my senior English class, I did a research project analyzing how capitalism and feminism interact. Where is that on the test? In my environmental science class, we learned about waste disposal by auditing our own trash production. Where is that on the test? It is insulting to each student’s individuality to treat us as interchangeable answer-producers. It is simplistic to try and reduce four years of high school to a single set of test scores. A test cannot define me, my teachers, my school, or my city. We are more than our test scores. The Philadelphia Student Union rejects high stakes testing, and we will continue to fight against the Keystones. Thank you.